After a four-hour delay HSB133 survives the first funnel of 2017. The bill passed out of committee with an amendment. After concerns about civil immunity related to Stand Your Ground were raised Representative Matt Windchitl clarified that under this bill anyone who’s been deemed to have acted in a reasonable manner in a self-defense situation would be immune from a civil lawsuit under section 707.6 of the Iowa legal code. We’ll be sharing the exact text of the amendment passed this by the House Judiciary Committee as soon as it’s made available. You can see video of the House Judiciary Committee’s debate and vote on our IFC Facebook page. HSB133 is now eligible for debate and a vote before the full House of Representatives. HSB133 is now eligible for debate and a vote before the full House of Representatives. There’s a distinct chance this bill could be brought to the floor of the House and voted on next Tuesday (3/7). 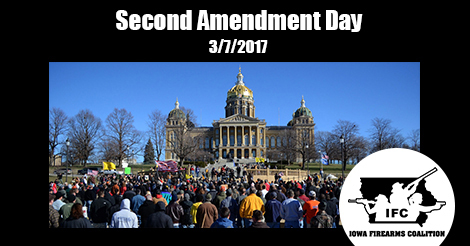 Reminder: the Iowa Firearms Coalition is hosting Second Amendment Day 2017 next Tuesday (3/7). Join us for a brief program starting at 10AM in the state capitol, room 102. We’ll introduce you to some key legislators who are leading the fight to protect and enhance the Second Amendment here in Iowa. We’ll also be talking about HSB133 and other important pro-Second Amendment legislation and how you can help advance our cause. Plus, there’s a chance we might get to see HSB133 get voted on in the House of Representatives. Make plans to spend the day in the capitol next Tuesday fighting to protect your right to keep and bear arms! Thanks for sending the update. I’ll be emailing those who voted for it, and also those against. Thanks for sending this update out, glad to know who voted for it…and also against!